Regular size 9oz glass bottle nestled in our signature eco gift box with gorgeously green recycled kraft tissue, hearts, dried flowers, twigs, herbs & spices. 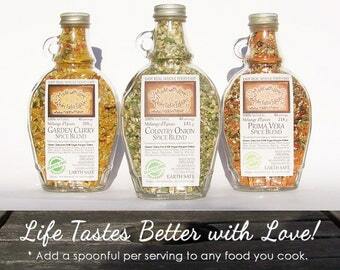 Makes Artisan Gourmet Magic Meals: pasta and sauce, stir fry, roasted oven dinner, salad dressing, amazing creamy dip, whole grain hot pot, risotto and more. Just add a couple of fresh ingredients and Voila! Tell all your friends I made it myself - its Made with Love. 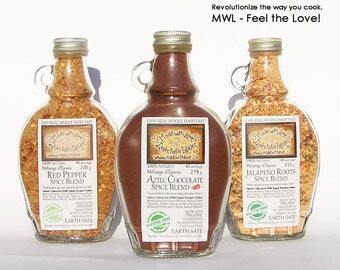 Everything is Made with Love with 100% natural, Non GMO, non-irradiated ingredients. We work hard to source RAW & organic fair-trade ingredients direct from small organic farmers often and everything we create is made lovingly by real human hands. 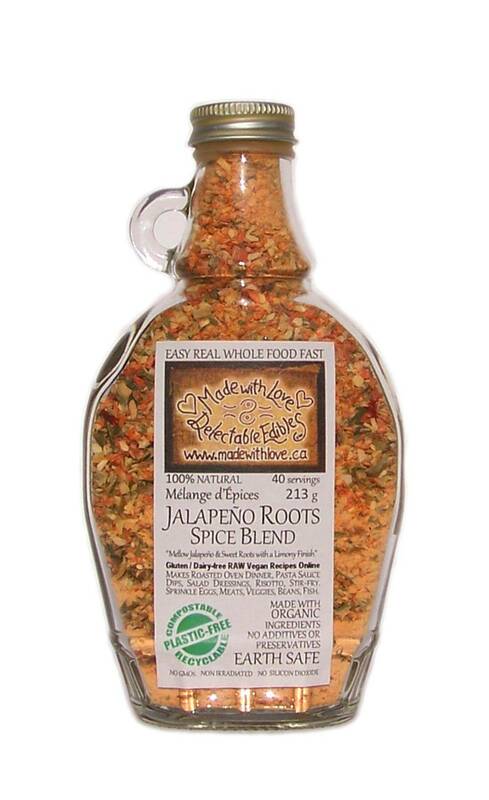 A rich blend of jalapeno with garlic, onions, sweet peppers and lime in a dried organic carrot base. Once more, this sugar/salt free blend uses natural vegetable sources to obtain a balanced flavour with natural sweetness. Creamy dips & pasta are gorgeous. Spice up your guacamole, veggies, meats or salsa. 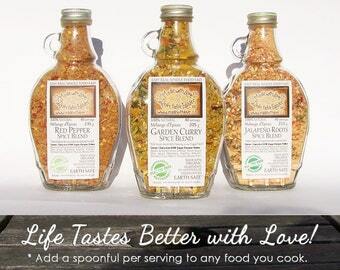 100% natural, handcrafted artisan blends of veggies, herbs and spices... feed yourself and your loved ones very well, while simultaneously nourishing self with calm simplicity and ease. 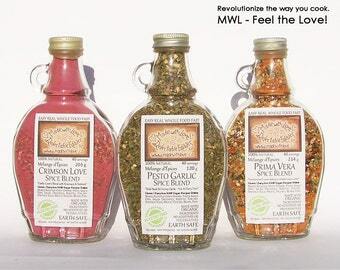 Use with our magic meal recipes to make gourmet meals in minutes... "10 minute" pasta bowl dinners with a rich gorgeous real cream sauce or a decadently divine clear sauce. Gluten-free, Vegan, Raw and Dairy-free recipe options provided. Each of our nine flavours are simply delicious in salads, soups, veggies, meats, fish... tofu, eggs, potatoes, sauces,pastas, breads or on the barbeque. Oven Roasted Dinner - Sprinkle well on a whole chicken or pork roast surrounded by sweet baby peppers and whole shallots. Make gravy with drippings and serve with mashed potatoes. Pasta and Sauce: just sprinkle noodles, add water & olive oil, OR coconut milk OR cream & stir. Stir fry: just sprinkle veggies and chicken, pork or tofu. 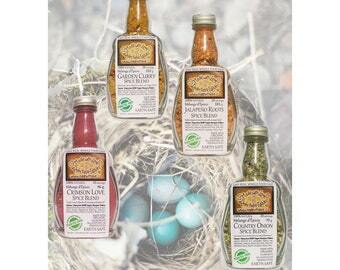 Marinade or Vinaigrette: Mix with Olive Oil and lime juice, great on baby greens or chicken. Cream cheese Spread: Mix with cream cheese. Chip Dip: Mix with yogurt or sour cream OR refried black beans and fresh lime juice. Mexican Hot Chocolate: Mix with boiling water and finish with cream or coconut milk. We welcome payment directly with Visa or MC by phone to 250 554 5031 or by email money transfer. Thank-you for your conscious spending! Together we are changing our world. 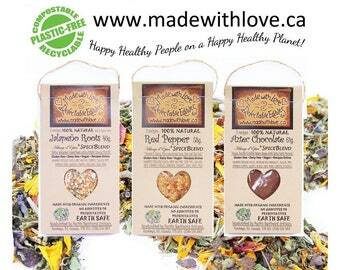 Our Motto: Happy Healthy People on a Happy Healthy Planet.